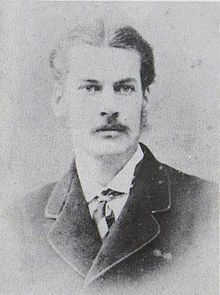 Ernest Mason Satow GCMG PC[note 1] (30 June 1843 - 26 August 1929), was a British scholar, diplomat and Japanologist. Along with William George Aston and Basil Hall Chamberlain, Satow was one of three major British Japanologists during the 19th century. In an overview of writings by and about Ernest Mason Satow, OCLC/WorldCat lists roughly 200+ works in 300+ publications in 9 languages and 4,000+library holdings. Japanese calligraphy by Satow. The kanji read (from right to left) "敬和" (Kei-Wa), literally "Respect and harmony". ↑ Ernest Mason Satow was known in Japan as "アーネスト・サトウ" (Ānesuto Satō), known in China as (traditional Chinese) "薩道義" or (simplified Chinese) "萨道义"
↑ Nussbaum, Louis-Frédéric. (2005). "Satow, Ernest Mason," Japan Encyclopedia, p. 829; Nish, Ian. (2004). British Envoys in Japan 1859–1972, pp. 78–88. ↑ London Gazette, Issue 25447, p. 858, 27 February 1885; retrieved 2012-9-19. ↑ Shaw, William A. (1906). The Knights of England, p. 348. ↑ London Gazette, Issue 27936, p. 5213, 31 July 1906; retrieved 2012-9-19. This page was last changed on 31 August 2017, at 01:16.